Confetti cones in a variety of colours to perfectly match your theme. Beautiful filled with fresh petals or for ease freeze dried petals, or wonderful alternatives such as lavender. It is worth remembering that wedding guests often forget to bring confetti and every bride wants that confetti shot! 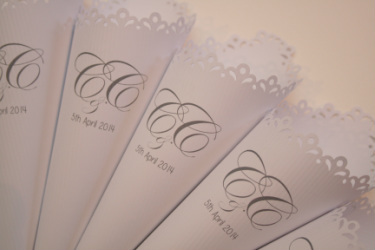 We feel that supplying the confetti for your guests is a lovely touch and if the confetti cones are coordinated with your chosen colour scheme all the better. 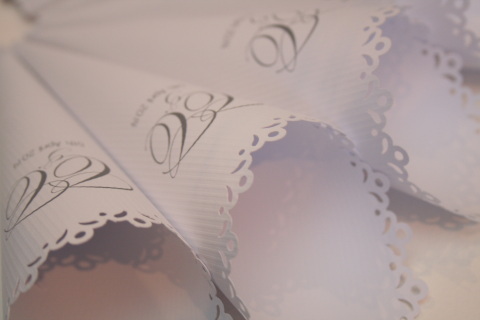 We use only the best quality card and paper beautifully designed and handmade to your specifications. Samples are available. Fill in the form below with your choices and then add to cart and we will contact you when we receive payment. Please note your design will be made to your exact details so make sure you are happy with the spelling. One proof will be sent and production of your cones will commence when you have confirmed that you are happy with the final design. Do not worry about the choice you have made at this stage, if you feel you have made a mistake there is an opportunity to let me know, I don't produce anything until I have confirmed with you. An example of Palace Script font with a decorative background. Delivery will be added when you checkout in Paypal. We will be in touch with you before we produce your cones with a proof of your monogram. If there are any details missing from the form you submitted don't worry I will be in touch to confirm all the correct details with you. Your cones will be dispatched in a sturdy postal tube within 2 weeks following proof approval.